The Dog Box Matakana is a rustic and relaxing Omaha Beach hideaway, perfect to get you near the summer fun while still being able to get away from it all. It’s a contemporary indoor/outdoor living accommodation ideally situated just a minute drive from stunning Omaha Beach and near to Matakana Village. Completely separate from the main dwelling on the property, this tropically landscaped, country oasis boasts uninterrupted views toward Tamahunga Hill and overlooks peaceful farm paddocks. 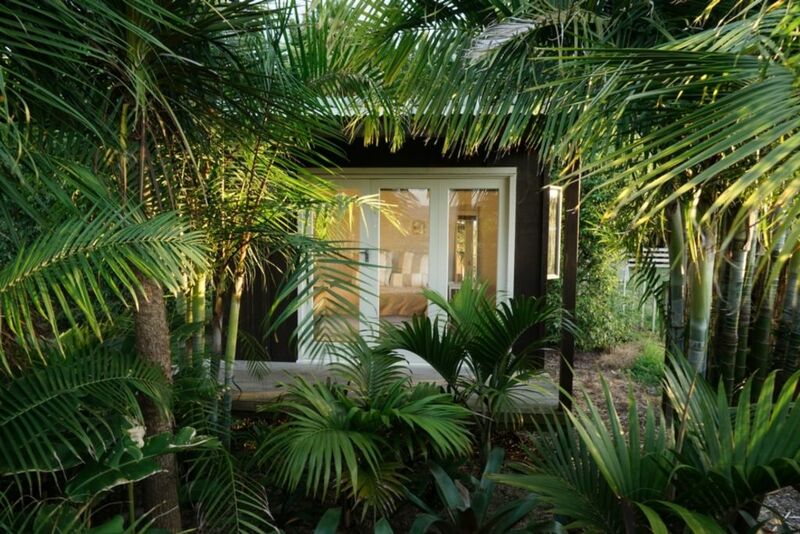 The modern, country chic bedroom is separate from the studio kitchenette and connected by a palm tree lined covered walkway that makes you feel right out in the elements while in the comfort of your cosy cottage. The kitchenette is fully equipped with everything you’d need to whip up a meal to take to the beach or enjoy on the wrap around deck. While perfect for a couple’s getaway, there is a pull out sofa in the living room for kids or your extra mate. Living area also includes a television and access to freeview. Second time back and equally as amazing. Such a special spot to escape the busy lives we live. Look forward to returning one day soon. My little family really enjoyed the Dog Box! Great location and very peaceful. Thank you to the hosts as well who were very helpful and good people in general. Would definitely recommend it to others in the future. Wonderful views,quiet and peacefull.very rrlaxing and comfortable. Great place, really want to stay again.